Magnum VOLUME® will give you that 3D cartoon muscle look every time you take it. This full-dose l-arginine-nitric oxide and nitrate-nitrite-nitric oxide-maximizing supplement provides so much oxygen, blood flow, and glucose in your muscle tissue, you’ll barely be able to get your jacket back on after your workout. And the effects last for hours. Volume® also increases your ability to perform more reps and recover faster by preventing phospho-creatine loss during training. This gets you back to the gym faster so you can get your swole back on quicker. 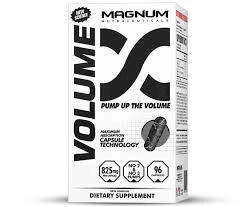 Magnum Volume is unique because it’s been formulated to not only maximize nitric oxide production, but also to halt your body’s ability to diminish nitric oxide once it’s been produced. This results in an amazing pump that lasts longer than anything you’ve every tried before. PUMP UP THE VOLUME! L-Norvaline inhibits Arginase, which diminishes the body's ability to limit nitric oxide production. Without norvaline, your body cannot maximize nitric oxideproduction from the other vasodilators you're taking.